Castle Car Wash: Limestone? Sandstone? 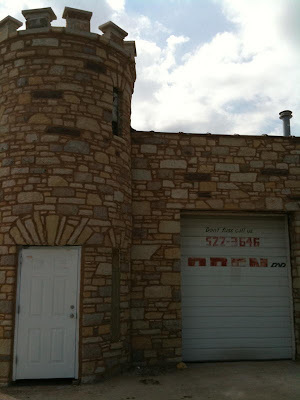 I have long had an interest in strange little buildings made of stone, as evidenced by my obsession with the petrified wood gas station in Lamar, Colorado, thus I am happy to report on a recent discovery of mine. It is another odd rock-clad structure, this time in the North Lawndale section of Chicago. 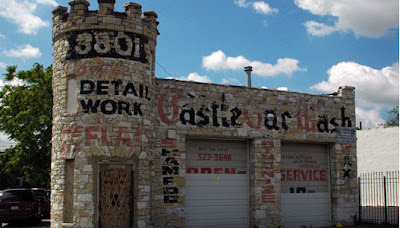 The building has held various names and businesses but seems most often to be called the Castle Car Wash.
Castle Car Wash began life in 1925 as the John J. Murphy Gas Station. Murphy had purchased the triangular property on the corner of S. Hamlin Street and W. Ogden Way in 1924. According to a National Register of Historic Places (NRHP) nomination written in 2005, Murphy sold gas from 1927 to 1964. The property sold in 1970 and variety of gas stations, auto repair shops, and towing companies filled the premises until it evolved/degenerated into the Castle Car Wash in the late 1970s. Murphy built the station on Ogden Avenue to exploit the road’s recent designation as US Highway 66, better known as Route 66, which terminated a few miles east of Murphy’s business near the shore of Lake Michigan. The early days of Route 66 were an exciting time as Americans began to rev up and hit the road. Between 1920 and 1930 the number of gas stations exploded from 15,000 to 124,000. By 1927, more than 20 stations dotted Ogden Avenue, along with garages, repairs shops, and dealers. As I quoted in my chapter in Stories in Stone about Lamar’s filling station, “The gas station…is undoubtedly the most widespread type of commercial building in America,” wrote Daniel Vieyra in Fill er’ Up: An Architectural History of America’s Gas Stations. What had begun merely as a way to distribute gas, evolved into the full-scale sales and service center so familiar to the American roadside. Vieyra breaks station designs down into four recurring themes. Most elegant were the Respectful buildings, which often resembled a Greek temple. Functional buildings catered to a motorist’s sense of efficiency, as exemplified by the simple, streamlined box. Domestic stations satisfied those seeking a more familiar or rustic look, such as an English or Tudor-inspired building. Domestic, Functional, and Respectful buildings did share one common theme; large companies designed them to foster a corporate image. Some station owners eschewed corporate branding and endeavored to attract motorists with whimsy. They built stations out of old planes and modeled them after lighthouses and windmills. They made them look like tank cars, oversized gas pumps, Brobdignagian oil cans, and colossal shells. Vieyra labels this architectural style Fantastic and delineates its golden age as 1920 to 1935. No one knows what inspired Murphy in his design but his little “castle” is definitely Fantastic, though the NRHP nomination describes it as Late Gothic Revival. The stone veneer building, with its corner tower topped by a crenellated parapet, must have been quite the sight in its glory days. Like many other older, whimsical buildings, Murphy’s station has suffered through vacancy and minimal upkeep. And what has been done hasn’t been good, including boarding up windows and removal of the parapet, apparently for safety concerns. A recent survey has revealed that the castle is the only Late Gothic Revival station remaining on Route 66. In response, Landmarks Illinois, a non-profit devoted to historic preservation, listed the castle on their Chicagoland Watchlist in 2008. 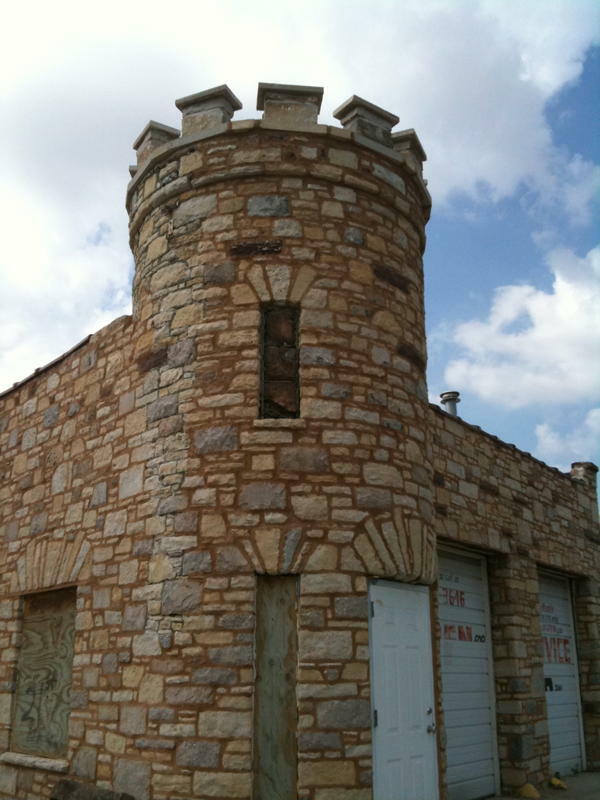 Fortunately, the stone gas station building has apparently been protected, at least for now. A new owner has plans to open it as a restaurant and has hired an architect to help with restoration. The roof has been replaced and the building cleaned and tuck pointed, though the parapet is still gone. I do hope it will be preserved; the castle is a unique reference back to an important era not just of Chicago’s history but of our country’s history when the automobile was just beginning its long run into the fabric of our lives. 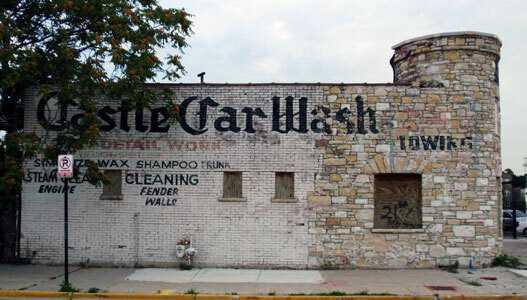 One last note, in researching John J. Murphy’s wonderful little gas station, I have discovered that North Lawndale is famous for its stone buildings, most of which were made from Salem Limestone. I plan to follow up soon with further information.